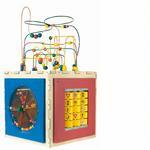 A new twist in our mini play cube series, 7 fun activities into one. 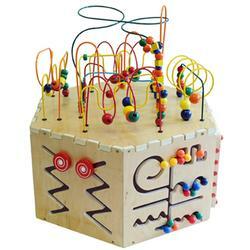 The shape, size, activities, wire & bead designs uniquley combined into a wonderful play experience for children.The cube is topped with the classic beaded wire rollercoaster, each side has an innovative, anatex toy. 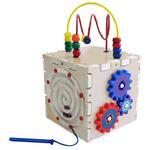 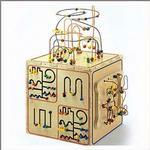 These include, the pathfinder,learn the alphabet,an abacus, gears, magnetic circle express, and Zigidy Zag Panel. 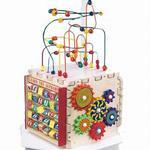 This toy is an excellent multi-sensory adventure as children develop visual tracking skills, letter recognition, color recognition,counting, eye-hand coordination & much more.